In each town, with the help of local volunteers of all ages, a children’s library was built, which holds regular read aloud sessions in addition to lending books to the community and local schools. The read aloud sessions at the library and the schools that borrow books to hold their own sessions, are performed by local teachers. The Read with Me team well equipped these local teachers for the task through a series of training workshops, e.g. reading aloud strategies, recognizing quality books, familiarity with children’s literature, and arts and crafts projects in connection with books. This cooperative library acts as a stable place of learning, growth, and happy experiences for more than 500 children of each town and neighboring villages. “Read with Me” is an innovative educational project designed and implemented by the Institute for Research on the History of Children’s Literature (IRHCL), to promote reading for and with disadvantaged children, who are deprived of cultural activities especially reading. With making quality books accessible to children of remote and deprived regions as its main objective, Read with Me employs forward-thinking principles of early education to promote a lasting love of reading and learning. In order to facilitate access to quality books, simple children’s libraries are erected in deprived regions using prefab structures. These libraries are then stocked with quality books and transformed into welcoming and visually stimulating environments to excite and encourage children to read. Read aloud sessions are held at these libraries on a regular basis, which are followed by discussions and activities to enhance the reading experience, solidify the message and influence of the book, and to promote self-expression, communication and confidence. These activities include creative arts and crafts projects, reenactments and plays related to the stories. Read aloud sessions give life to the written words, paint a mental picture of the story setting, and animate the actions and events of the stories for children. These enchanting sessions, along with follow-up group discussions and fun-filled activities, maximize the pleasure of hearing a story, while improving basic literacy and emotional awareness and growth. When silent, empty, and cold rooms with bare walls are transformed into colorful spaces overflowing with books and visual aids for sounds, phonemes, words, shapes and narratives, then we have warm spaces that stimulate the young mind and yield emotional development. 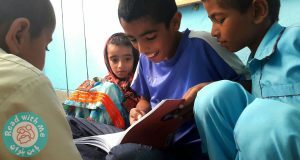 By cultivating their mind and character, the Read with Me project hopes to equip underprivileged and deprived children with necessary tools so they can rely on their own power to save themselves from social and natural harms and to open the door to a fuller and richer experience of life in the future. Aiming to give the chance of a better quality life in the future, through education, to deprived children is where KCIS and Read with Me overlap. And that is why KCIS is proud of and committed to supporting and collaborating with Read with Me.